This cellarette consists of a teak and brass bound lid leading down to the main body also being teak and brass bound of superb patina. 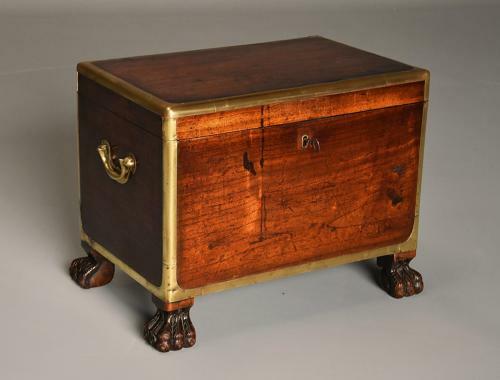 The lid opens up to reveal an interior with two compartments with central shaped mahogany divider, each of the ends has a brass carrying handle and there is a lock and key to the front leading down to four stylised carved hairy paw feet. This cellarette is in excellent, original condition for age, is of stable construction and can go straight into a home.